"Big Guy" redirects here. For information about the boss in Yoshi's Island DS, see Big Guy the Stilted. 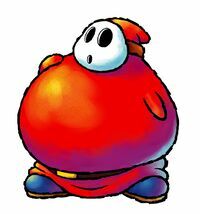 Fat Guys are corpulent Shy Guys that debuted in Super Mario World 2: Yoshi's Island. 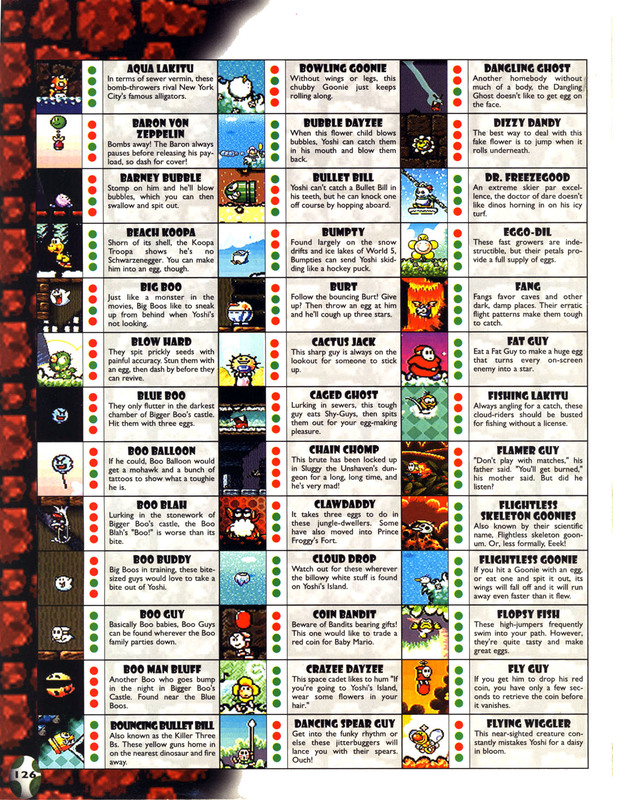 Fat Guys make their first appearances in Super Mario World 2: Yoshi's Island level Lakitu's Wall, and are uncommon enemies throughout the rest of the game. They come in two colors: red (which initially walk but will run if Yoshi stands on them) and green (which are always running). Fat Guys simply walk or run back and forth continuously, changing direction when they encounter a wall or a margin, unlike regular Shy-Guys which walk around and may stop and turn back on their own will. They are able to damage Yoshi if they bump into him, but Yoshi can attack them by eating and ingesting them. If spat back, they will resume their behavior. Upon ingesting a Fat Guy, Yoshi receives a Giant Egg. Fat Guys can also be used as platforms to cross obstacles such as spikes, as they are not damaged by jumping and Yoshi can safely stand on them. When Yoshi has three Giant Eggs at his disposal, all of the Fat Guys will disappear until Yoshi uses at least one of the Giant Eggs. 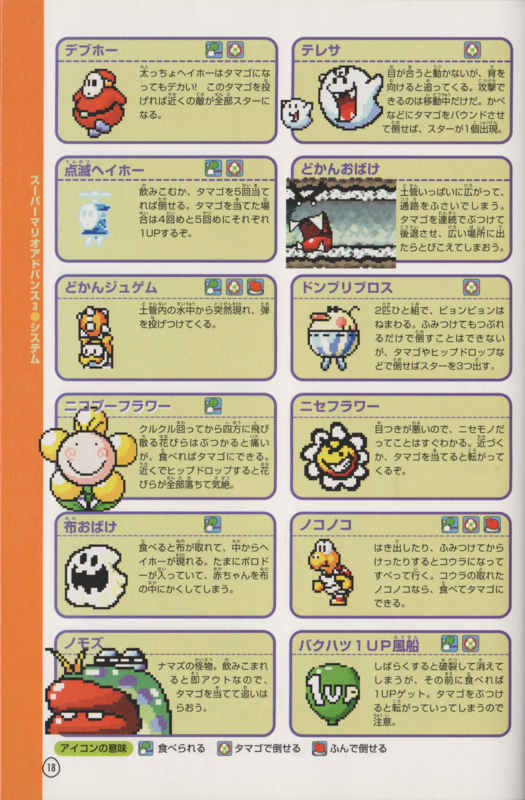 Fat Guys reappear in Yoshi Topsy-Turvy, where they appear distinctly larger, being now roughly three times the size of Shy Guys instead of two. Fat Guys return in Yoshi's Island DS, where they behave similarly to their first appearance. In Yoshi's Crafted World, red Fat Guys appear in Poochy's Sweet Run where they are found in different stances. Some simply walk back and forth on the ground and will start running after being jumped on, much like in their original appearance. They can be defeated by throwing an egg at them, charging into them with Poochy, or by eating and turning them into eggs. Ingesting a Fat Guy will grant six regular Yoshi Eggs instead of one Giant Egg like in past games. Other Fat Guys stand on the sides, pushing rectangular cutouts in Yoshi's way and rising them back up after a short time. Yoshi can hop on these objects while they are down and use them as platforms, and even ride them upward as the Fat Guys pull them back upright, much like Whomps can be used in New Super Mario Bros. In some cases, Fat Guys push these objects onto thin stilts and create a platform over a dangerous pit. In Paper Mario, an individual Fat Guy named Gourmet Guy makes an appearance as a gatekeeping NPC during the events of the fourth chapter. This page was last edited on April 20, 2019, at 12:38.